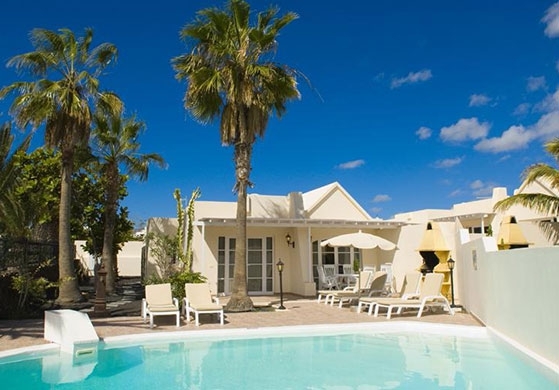 In the residential area of Matagorda, in Puerto del Carmen, we find the Cinco Casitas Villas holiday complex, a beautiful and quiet group of five individual villas with private swimming pools and a multitude of services and facilities included. 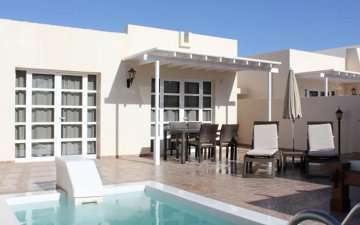 It is just 25 metres from Matagorda beach and the famous, busy Avenida de las Playas, a pleasant seaside promenade over 10 kilometres long beside the sea, from the centre of the tourist enclave to Arrecife, the capital of Lanzarote, Canary Islands. Cinco Casitas Villas is one of the most exclusive Orly Club accommodations, one of the best tourist accommodation companies in Puerto del Carmen, with over 20 years of experience in the sector. From hotels with all services included to holiday rental villas like Cinco Casitas, including private bungalows and all types of apartments, Orly Club will fulfil the expectations of any visitor. This accommodation, along with the exclusive treatment of our personnel and the quantity of services that we make available to you will make you enjoy the holiday that you have always dreamed of. 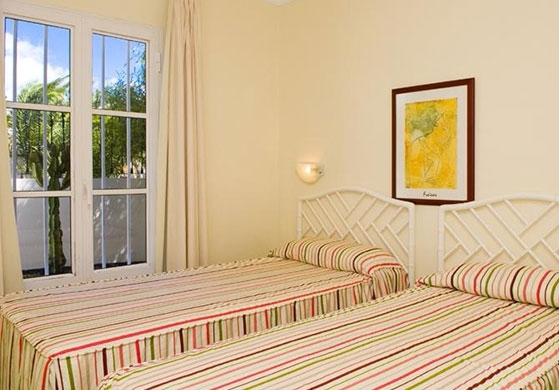 At Cinco Casitas Villas we offer two or three bedroom accommodation according to your needs. Each villa has a private swimming pool, two or three double bedrooms (one with a double bed and the other with two single beds), a fully equipped kitchen, a living room with satellite television, full bathrooms, a private terrace with hammocks and parasol and a multitude of small appliances and electrical devices which will make your stay a five star experience. Cinco Casitas Villas is the ideal option for all couples, families or groups of friends who wish to enjoy their privacy and those who like to “do it themselves”. With a private terrace and swimming pool, a kitchen equipped with all the utensils that may be needed for any type of cooking and a living room/dining room also designed for families or friends, our villas are the perfect place to spend a holiday and enjoy the privacy that a rental villa can offer you. Matagorda, the part of the island in which we are located, is the excellent residential area of Puerto del Carmen, as the idea of tranquillity and wellbeing offered to guests by our villas stands out. You will be able to live normally and feel at home, surrounded by a totally unique, unparalleled natural environment. It is a very quiet area with easy access to the main motorways of Lanzarote. Despite being located in a residential area, the villas are very close to the beach and the commercial area of the town, with a multitude of restaurants to enjoy and numerous leisure activities to choose from. Lanzarote is a place to enjoy, It is the most eastern of the Canary Islands, and is one of the most famous and most visited by people from all parts of the world. This is not surprising, as Lanzarote has a unique geography. With its pure, unparalleled geological elements, its mountainous, underwater and lunar landscapes, its distinctive beaches with crystal clear water, the colour of its ground, its lush palm trees and unique vegetation, along with the general harmony which is felt on the island, Lanzarote has something for everyone. We encourage you to discover it for yourself!